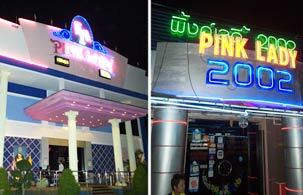 Pink Lady also serves yummy Thai and Chinese food with cool fresh beverage. Completely enjoy with pretty charming female singers who sing beautiful songs for your request every night. Our singers are selected by their attractive appearances and impressive services. Welcome these lovely singers with precious garlands for their gifts if they make you happy and amusing. The price of the garland only starts at 300 baht. Relishing our best entertainment and delicious food with special Thai prices will give you unforgettable experience.